"This is a brilliant idea and is exactly what is needed! Unfortunately we can't fund you!" In 2003, six enthusiastic potential stakeholders sat around a table, all wanting to get involved in supporting the development of a new tourism website for the Wicklow Way. Once the Walking Representative from Fáilte Ireland said that the project could not be funded under the proposed format, the others declared their hand in that they were all part-funded by Fáilte Ireland and were unable to continue and so, one by one, the line of dominos collapsed. So, what was the problem? Well, to walk the entire Wicklow Way means staying in accommodation at some point which is not Fáilte Ireland approved. Not all small, rural bed and breakfasts can afford the tourist board's annual fees and the expensive list of modifications needed to adapt their homes to gain approval. As it is Fáilte Ireland's role to solely promote its own members, it is simply not possible for them to put a credible website together on most of the Irish long-distance trails. It would have been ridiculous to have a website suggest that walkers should struggle to complete a 50km stage when in reality, there are accommodation options in the middle. It was with a heavy heart that we left the table that day without any investment in order to pursue a purer goal. The following year saw the launch of the Wicklow Way website, untethered from the red tape of Fáilte Ireland and able to address the crucial information that every walker needs when planning their holiday – where to stay at the end of each day. This was thanks to the funding of 30+ accommodation providers along the trail, who continue to lend their support to the website today. 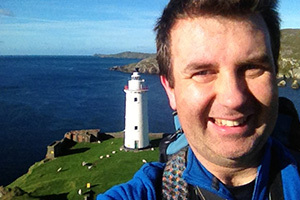 My name is Eoin Reilly and since the rocky road in establishing the Wicklow Way website, I have gone on to set up several other trail websites (listed below). After Ireland's spectacular economic collapse in 2007, I had to reinvent my landscape photography business and I became more closely aligned with walking tourism. Trailhead was formed in 2008 and is the starting point online for buying all the relevant printed material for long-distance trails. Along the journey, I have written a guide book on the Causeway Coast Way for Rucksack Readers. I met, and subsequently married my wife, Colette Dunlea, on the lower slopes of Derrybawn on the Wicklow Way. Having tested our marriage vows on honeymoon on a particularly wet and treacherous Milford Track in New Zealand (see photo), we have gone on to have two young boys who are now following in their parent's footsteps and becoming active adventurers on the Irish hillside. Whilst having pulled back on trail website development in order to remain close to home and raise our two boys, it is my ambition to properly document Ireland's 40+ long distance walking trails over the coming years, with the Beara Way in West Cork due for completion in October 2017. It takes over three months to put together a dedicated trail website and this is done best when there is no external red tape involved. It is through your support and custom through buying your maps and guidebooks through the Trailhead website that I can have the funding I need to continue in my pursuit in helping serve you with the planning of your walking holidays in years to come.